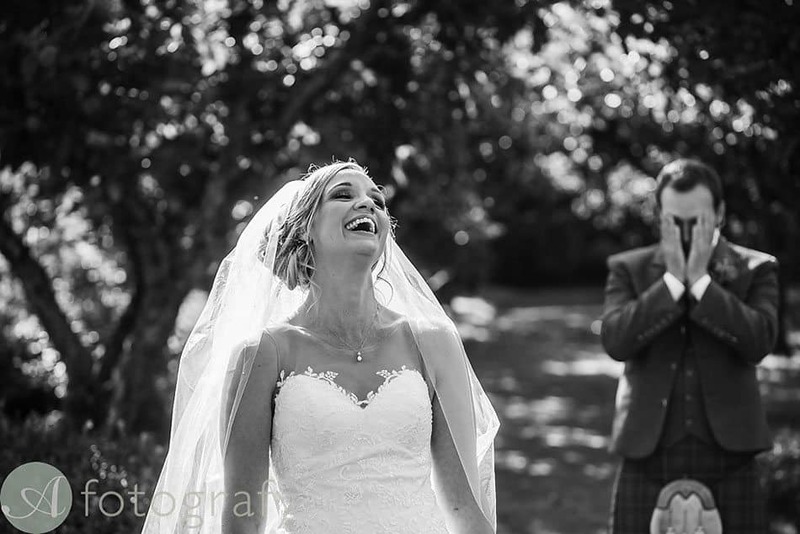 It was my pleasure to document Mr and Mrs McPhee day at The Byre at Inchyra wedding. During our initial meetings these guys kept telling me how camera shy they are. Definitely not true, I simply could not get very serious faces from these guys. Both of them kept giggling and having a great time. Day before wedding it was pretty stormy day and I started to get a bit nervous, but I shouldn’t. I think guys very praying pretty hard and they managed to set their ceremony outdoors. Crisp dry and sunny morning led everyone in pretty relaxed moods and day could start. Boys got ready home and girls had a great getting ready at the venue. Daniela was documenting boys morning. Loved seeing those flasks, made me smile. Sheonagh wedding dress was just amazing, loads of pretty details. Flowers were out of this world and really nice touches with ribbons. Little flower girl had pretty crown too. There were nice moments during ceremony too. Loved idea of sealing the box with letters. Sofia and Aidan did very good job as flower girl and paige boy. Loved their walking down the aisle images. The venue. I could write quiet a lot about the venue. Very helpful staff. Magnificent grounds for photos. Wall garden was perfect for those autumn images. Apple tree ally is awesome. Guys did amazing job with decorating venue. Table setting were world/travel theme and oh my, these were A M A Z I N G. Haven’t seen anything like that before. It was perfect touch. See images to know what I mean. Every guest got a sparkler and we did pretty sparkler image. Thank you all who participated and thank you to person who helped orchestrate this. I had no voice left and he shouted instructions. I must say big thanks to Sheonagh and Richard for allowing me to document their day. Amazing experience and loads of beautiful moments for them to treasure. Lets have a look at photos. Special thanks to my second photographer Daniela too. Fantastic job as always.